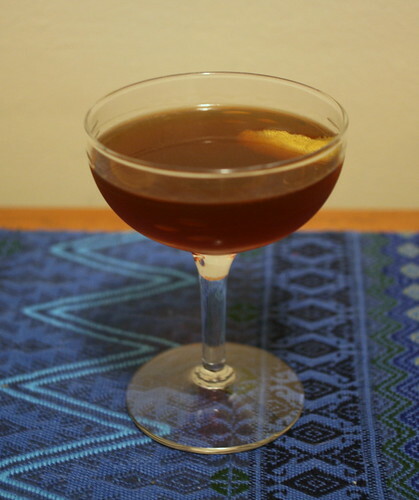 This month's Mixology Monday theme is "Amaro", chosen by none other than co-author Chuck Taggart over at Looka. What an interesting topic; there are tons of amari, all different and many of them quite mixable. They range from light herbal vermouth-esque liqueurs to real monsters of bitterness, like Campari, Fernet Branca (the legendarily bitter drink that'd be a punchline more than a tipple if it weren't so complex and beneficial), and Malört. I picked one somewhere in the middle -- Amaro Ramazzotti. (I also picked it because it's an ingredient in "Amer Boudreau", Jamie Boudreau's replication of the incredibly-hard-to-find Amer Picon. So if I make some of that, then I can have Picon Punches and Bywaters. I need to get on this, I think.) It reminds me of a good sweet vermouth, like a Vya or Punt E Mes, or Carpano Antica Formula, and that make sense -- it's Italian-made, intensely herbal, with a sweet note on top of all the bitter funkiness underneath. My first thought was to try something with rye and Cherry Heering, as kind of a Manhattan variation. I was also thinking of chocolate-covered cherries, and kirsch-filled chocolate bars, and decided that it might be really interesting with the Bittermens Xocolatl Mole Bitters (which are unique and excellent) but then Chuck posted the wonderful-looking Eagle Rock cocktail, featuring rye, sweet vermouth, amaro, Cherry Heering, and mole bitters. Foiled! It was time to regroup. Stir with ice for at least 60 seconds until very cold. Strain into a chilled cocktail glass, and garnish with a flamed lemon peel. Where did you find the Ramazzotti? I'm local. I've found Campari, Fernet, Aperol and Luxardo amaros around, but haven't heard of that brand before. I got it at Grand Liquors on 31st St in Astoria, just south of the 30th Ave N/W train stop. Astor Wine & Spirits likely has it, too. This is really a good drink! I'm always looking for things to do with those Fees Rhubarb and Cherry bitters, so cheers for the recipe.